Can Hot Flashes Be Minimized or Even Eliminated? How can you reduce the changing tides of hormonal imbalances? Many women who have gone through menopause say it is far more difficult than having a baby because menopause is a longer, protracted and difficult process. While starting a family signifies the start of a lifetime of joyous satisfaction, menopause is a challenge that is usually associated with the mid life aging process. There are a lucky few that sail through menopause without the dreaded symptoms so many of us complain about. The average menopause age in the western world is 51 years and most women go through the menopause between 45 years and 55 years. Most women experience one or several of the following symptoms associated with menopause: Hot Flashes, Night Sweats, Headache, Insomnia, Depression, Weight Gain, Fatigue, Mood Swings, Vaginal Dryness, Low Libido. Adding further confusion and fear to the issue is the escalating concern over hormone replacement therapy (HRT) to do with its compounding risk factors associated with breast cancer, ovarian and cervical cancer, diabetes, heart disease and other related issues. Women are seeking help through natural alternatives, many of which are tried and true. How Does Renew You Treat Menopausal Symptoms? Michelle Honda PhD addresses the body as a whole. The endocrine system must be working at optimum in order to alleviate and balance menopausal symptoms. A dietary regime is applied and adjusted according to the individuality of the patients needs. The diet recommendations encompass deficiencies on a nutritional and supplemental level, detoxification, boosting the immune system, weight loss and so on. Also counselling and addressing any negative feelings which normally accompany menopause. She uses natural prescription products, plant extracts, nutrition, natural supplements and counselling in her protocol of treatment. You will need to take several supplements regularly to support you metabolic functioning & estrogen levels. Call today to book an appointment or e-mail us. 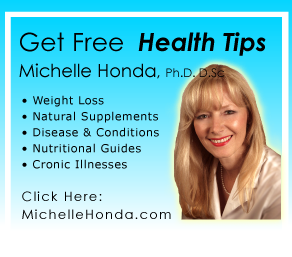 Michelle Honda PhD has the ability to help a very wide variety of health concerns. Persons who are particularly drawn to her are; 1) persons who have an incurable problem 2) persons who have a mysterious un-diagnosable problem or 3) persons who have a chronic problem that is not healing itself via other therapies or modalities. In general, persons who are interested in alternative health also like Holistic Medicine. Renew You Holistic Health offers a FREE 15 minute telephone consultation with a Renew You staff person to assess and discuss your particular situation. We are happy to discuss your concern and health history to see if we can help you.